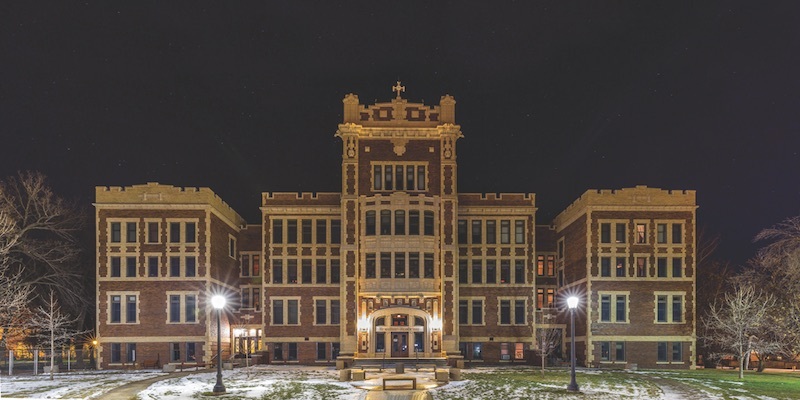 It’s a splendid old building, the Ursuline Centre—64,000 square feet of brick and mortar, eight winged gargoyle waterspouts, four floors and a tower, adorned with terra-cotta coping and embellishments. The iconic structure overlooking Great Falls’ Central Avenue has served the community since its opening on September 3, 1912. Hundreds must pass it every day, but how many stop to marvel at its beauty? Admire its history? Appreciate its mission? The Ursuline Centre is no relic; it’s a venerable institution, alive and well. Children are educated here. Catholics attend mass. Guests—the spiritual and the secular—are ministered to. The Ursuline Centre serves the people as needed… in the tradition of those who established it more than 100 years ago. A blizzard savaged southeastern Montana (Territory) on January 18, 1884. On that day, Miles City was met with two forces of the Almighty—the winter storm and the Sisters of the Ursuline Order. Along their pilgrimage through Montana, the Sisters traveled west to Great Falls. It was the turn of the millennia and the city was flourishing, but what it noticeably lacked were quality educational facilities. Four city blocks were dedicated for the foundation of an Ursuline school here, with famed local architect George H. Shanley commanding its design. Ursuline Mount Angela Academy served the Great Falls community for decades, but needs changed, and the educational landscape of Great Falls was evolving. In 1966, the Ursuline Sisters closed the academy. Praying for guidance, they explored alternative ways to serve the community with their magnificent facility. The Heritage Museum and Heritage Gallery are located on the second floor of the Ursuline Centre, honoring the incredible history of the building and its founders. (Free tours are offered upon request.) The Heritage Museum houses a collection of original furniture, Native American gifts (given to the Sisters), period clothing, photographs, and historically significant items from when the school was open. It isn’t hard to imagine how the facility served students in the past. Much of the building has maintained its historical integrity, and moreover, its classrooms are utilized by students today. The former Mount Angela Academy (which primarily served young women) is now a preschool. Trunkle’s own children attended the preschool prior to his employment at the Ursuline Centre. The facility’s educational and outreach programs are, in part, what drew him to the organization. “The Ursuline Centre is always looking for new opportunities to educate and serve the community,” he says. He goes on to elaborate that the Ursuline Centre’s comfortable, private, and historic dorm rooms can lodge up to 125 people. Guests have access to private showers, can utilize the facility’s wireless internet, and can prepare and store meals in a secondary guest kitchen. A comfortable dining room has seating for 100 guests, and the auditorium (with its two-tiered stage) can seat 220. A spacious gymnasium can be rented as well. With a wealth of space and amenities, the Ursuline Centre is perfect for hosting retreats, wedding receptions, and get-togethers of all kinds. The facility also provides affordable temporary boarding to foreign exchange students, AmeriCorps volunteers, college interns, and others. Trunkle says that the Ursuline Centre’s affordability, huge campus, and central location all play a role in its success as a retreat center, but he believes the facility’s guests are drawn to its heritage as well. “They have a respect and admiration for what this building represents,” he says. And what does the Ursuline Centre represent?